Astronaut Paul Weitz Dies At 85; Veteran Of Skylab And Shuttle Missions : The Two-Way Selected by NASA in 1966, Weitz went on to fly on the first manned Skylab mission and performed vital space walks to fix the stricken station. He later commanded the maiden flight of Challenger. 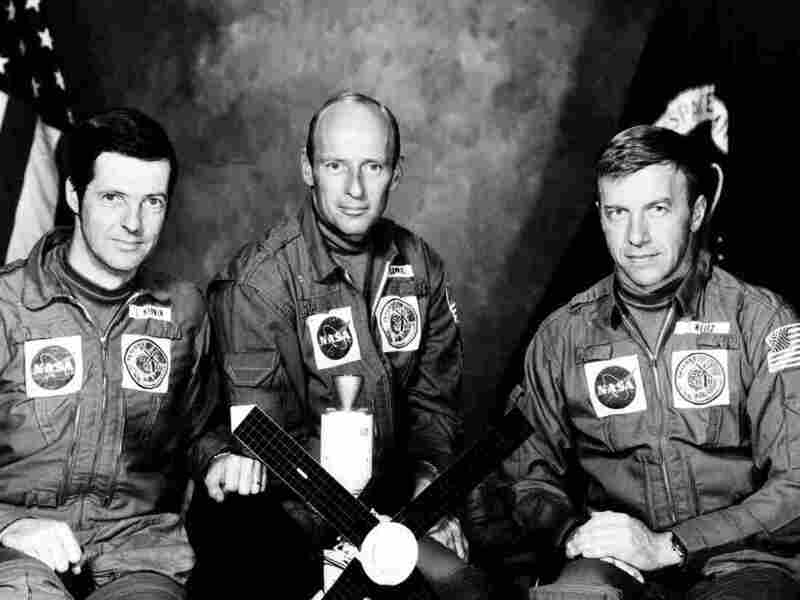 American astronaut Paul J. Weitz, right, with Joseph P. Kerwin, left and Charles "Pete" Conrad Jr., center. The crew of the first manned Skylab mission is shown in May 1973. Former NASA astronaut Paul Weitz, who spent nearly a month in orbit on the first manned Skylab mission in 1973 and flew a decade later as mission commander on the maiden voyage of the Space Shuttle Challenger, has died at 85. "We're saddened by the loss of retired astronaut Paul Weitz," NASA said on Tuesday. Weitz died in Flagstaff, Ariz., on Monday; he had been diagnosed with myelodysplastic syndrome, a type of blood cancer. Weitz was born in Erie, Pa., and graduated from Penn State. He joined the Navy and became an aviator and test pilot, eventually rising to the rank of captain. He was chosen in NASA's fifth round of astronaut selection in 1966, as the agency was ramping up for the Apollo moon program. On his first space flight, he served as pilot on Skylab-2 (SL-2), along with Apollo 12 veteran Charles "Pete" Conrad, Jr., and Joseph Kerwin, also a rookie on SL-2. The mission to fix Skylab, which had suffered significant damage during the space station's launch, is still considered one of the most difficult and dangerous in the annals of spaceflight. The three astronauts had to conduct multiple space walks to repair the damaged craft, deploying a giant reflective parasol to act as a sunshade in place of a damaged thermal shield. "Weitz conducted a 'stand-up EVA' — his head and body protruding out the Apollo command module's hatch while Kerwin held him by the ankles from inside — in an attempt to free [a] stuck [solar] array,' according to CollectSpace.com. Weitz logged two hours and 11 minutes in space walks and the crew of the mission established a new world record for time in space – 672 hours, 49 minutes. "We had to get the temperatures under control if we were going to salvage Skylab at all," he told NASA in an oral history recorded in 2000. Years later, Weitz returned to space when he commanded the critical first mission of Challenger, NASA's second flight-worthy Space Shuttle orbiter, lifting off on April 4, 1983. The successful flight lasted five days. "Before it became commonplace to come out of retirement, Paul was a pioneer," said Curtis Brown, chairman of the Astronaut Scholarship Foundation. "He proved 51 was just a number." In the final chapter of his NASA career, Weitz served as deputy director of the Johnson Space Center, retiring from the agency in 1994.